What are Volatile Organic Compounds (VOC’s) that we hear so much about? Simply, they are chemicals which are carbon-based (hence the “organic” in the name, as organic chemistry is the study of carbon containing compounds) and which volatilize – or rather, evaporate or vaporize – at ordinary (atmospheric) temperatures. This is a very broad set of chemicals! 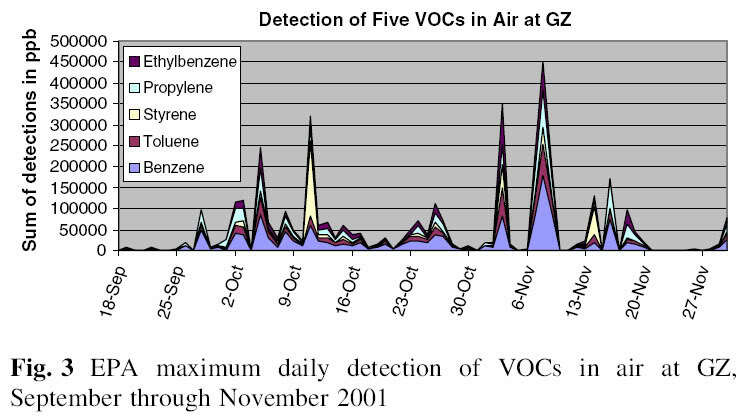 These volatile organic compounds (VOC’s) are ubiquitous in the environment. You can’t see them, but they’re all around us. They’re not listed as ingredients on the products you bring home, but they’re often there. The most common VOC is methane, which comes from wetlands and rice agriculture to …well, “ruminant gases” (or cow farts – which are actually not a trivial consideration: cows are responsible for 18% of all greenhouse gasses – read more here). 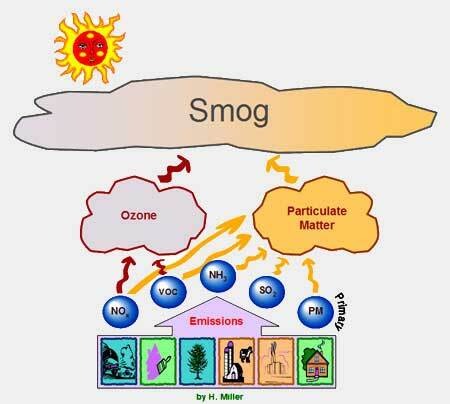 We ourselves contribute to CO2 emissions each time we breathe out. They’re also in paint, carpets, furnishings, fabrics and cleaning agents. Under European law, the definition of a VOC is based on evaporation into the atmosphere, rather than reactivity, and the British coatings industry has adopted a labeling scheme for all decorative coatings to inform customers about the levels of organic solvents and other volatile materials present. Split into five levels, or “bands”, these span minimal, low, medium, high, and very high. These differences in definition have led to a lot of confusion. Especially in the green building community, we think of VOCs as contributors to indoor air quality (IAQ) problems—and the amount of VOCs is often our only IAQ metric for a product. But there are lots of compounds that meet a chemist’s definition of VOC but are not photoreactive (as in the EPA definition) so are not defined as VOCs by regulators. Some of these chemicals—including formaldehyde, methyl chloride, and many other chlorinated organic compounds—have serious health and ecological impacts. Manufacturers can advertise their products as being “low-VOC” – while containing extremely toxic volatilizing chemicals, such as perchloroethane in paint, which is not listed as a VOC by the EPA and therefore not required to be listed! The Canadian government (bless em) has an extensive list of which chemicals are considered VOC’s and you can access it here. When products are identified as to which might contain VOC’s, furnishings are often cited and formaldehyde is the chemical highlighted, because it’s the chemical used most widely in fabric finishes. However, there are many other chemicals on the list which are used in textile production, such as benzenes and benzidines; methylene chloride, tetrachloroethylene, toluene and pentachlorophenol. Some manufacturers advertise the amount or type of VOC in their products – and that may or may not be a good indication of what is actually released into the air, because sometimes these chemicals morph into something new as they volatilize. The key word to remember is: reactive chemistry. The chemicals don’t exist in a vacuum – heat, light, oxygen and other chemicals all have an effect on the chemical. VOC’s are also found in our drinking water – the EPA estimates that VOC’s are present in 1/5 of the nation’s water supplies. They enter the ground water from a variety of sources – from textile effluents to oil spills. The EPA lists VOC’s currently regulated in public water supplies (see that list here); they have established a maximum contaminant level (MCL) for each chemical listed. But little is known about the additive effects of these chemicals. For indoor air quality purposes we should look to results from chamber testing protocols that analyze key VOC’s individually. Most of these protocols – such as California’s Section 01350, GreenGuard for Children and Schools, Indoor Advantage Gold and Green Label Plus – reference California’s list of chemicals for which acceptable exposure limits have been established. But even this is not a comprehensive list. Indoor air quality is certainly important, but in the case of fabrics there are many chemicals used in production which do not volatilize and which are certainly not beneficial to human health! These include the heavy metals used in dyestuffs and many of the polymers (such as PVC). So VOC considerations are just one part of the puzzle in evaluating a safe fabric.